Flash sale alert! 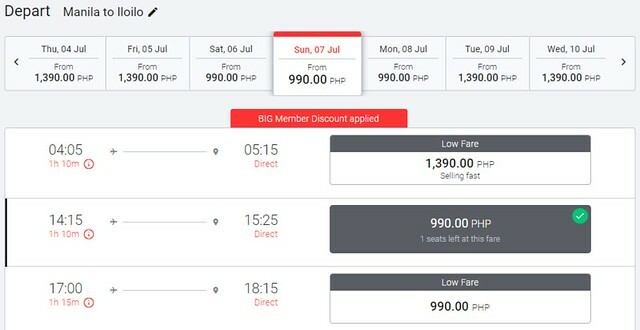 Book now and fly from as low as Php199 all in one-way fare. Book flights from Clark, Cebu, Davao and Manila to select domestic destinations. Enjoy the lowest fare to Iloilo from Clark or Cagayan de Oro starting from Php 199 one-way. Flights to Cebu, Caticlan, Davao, Tacloban and other domestic destinations are also on sale. See below for the list of destinations included in this AirAsia seat sale. Visit the official website of AirAsia to book your flights. You may also find and compare cheap flights by visiting these websites – Skyscanner, Momondo or by using the flight search below. Promo seats are limited and subject to availability. Fare is not available during embargo period. All fares are quoted for single journey (one-way) only. It includes airport taxes except for selected airports where airport tax is collected at the point of departure. All taxes must be paid at the time of purchase unless otherwise stated. A non-refundable processing fee is applicable for payments via credit, debit or charge card. Full payment shall be made upon booking. Refunds are not permitted after payment has been made. Changes to flights and dates are permitted subject to change fees. Changes to name are not permitted. Visit www.airasia.com for more information. Guests travelling need to provide all necessary travel documents (e.g. valid passport, visa where applicable etc) at the time of departure. AirAsia reserves the right to deny guests from boarding without proper documentation. Visit www.airasia.com for more information.